With the release of the .NET Framework 3.0, and then the .NET Framework 3.5 late last year, you might have settled down and started to integrate some of their more powerful features in your day to day programming. You may have absolutely fallen in love with LINQ, and embraced lambda expressions in C# 3.0. But have you taken a good look at WPF? WPF is not just for flashy effects, perfect transparency, and smooth animations. It’s not limited to kiosks and Silverlight infused web pages. It provides base components out of the box that can blow your WinForms socks off — and not just visually. 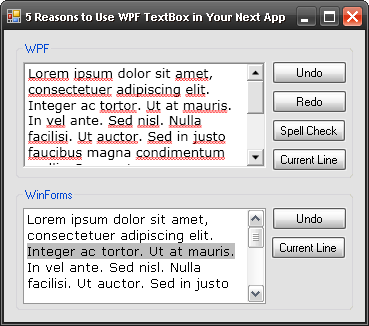 In this article I will pit System.Windows.Forms.TextBox against System.Windows.Controls.TextBox in a completely biased and unforgiving matchup, and give you 5 reasons why you should ditch the your old WinForms TextBox, and start using WPF. So grab the sample code, and follow along. 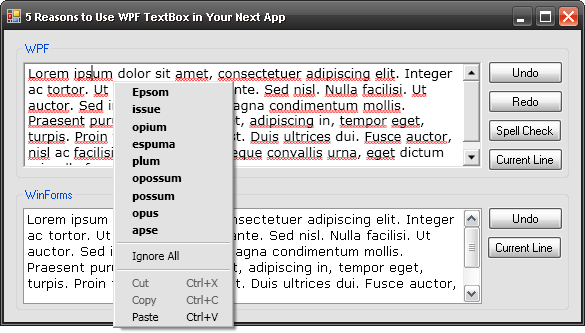 The rest of this article would kind of be pointless if this was not included, but you can use the WPF TextBox control from within a Windows Forms application. All you need to do is include some references, and add an ElementHost control to the form. I’m not going to get into specifics here, because there is plenty of coverage of this elsewhere. This is something that I’m surprised has not received more coverage. People get caught up in animations, and the ability to completely change the appearance of controls, and miss the fact that a simple task is now actually simple. You don’t have to rely on your users having a $200 piece of productivity software installed to do spell checking on your “Approval Comments” field. You can just use a more intelligent TextBox. Have you ever written code that manually called the Undo method of the TextBox control, and been disappointed with the results. Spoilers follow for those who have not tried this: it only keeps track of the last state of the text. Since the advent of Adobe Photoshop* in the late middle ages, people have grown accustomed to programs being able to undo as many actions as they have done. Well with the WPF TextBox control that functionality is built-in. If you find implementing a custom Undo Stack fun, then cling tightly to the WinForms TextBox, if you would rather forego that task so that you can focus on a more important problems continue reading. Just be sure to never include those two lines of code one right after another like that. People have been immortalized for less. Go ahead and click the screenshot to the left. Okay, pop quiz: What line is highlighted? 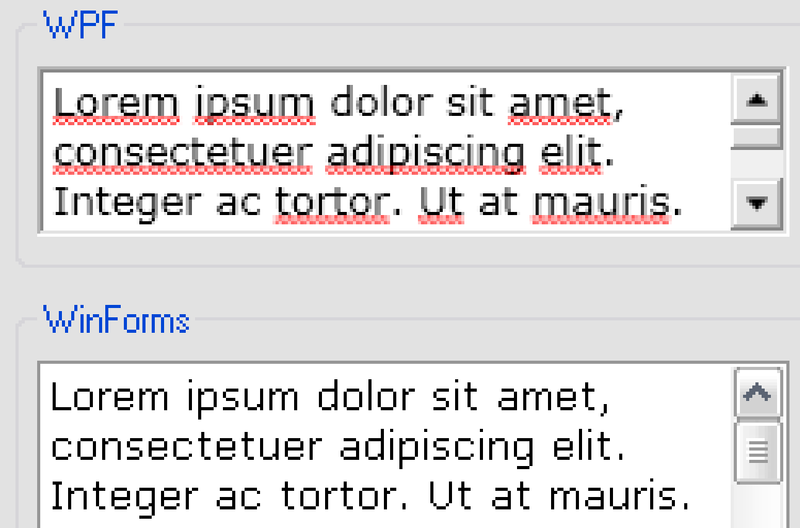 If you said the line beginning with “Integer ac tortor”, System.Windows.Forms.TextBox says you’re incorrect. 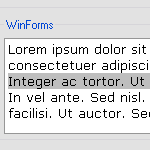 Many programmers might agree with the Windows Forms TextBox control, and that’s because they’re right. 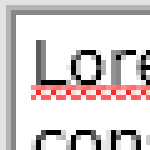 Technically the text is word wrapped, and the newline character doesn’t occur until the very end of all of the text pictured. But looking at this from a user experience standpoint, it’s terrible. When wrapped, that is the third line of text, not the first. Let’s be honest, your grandma’s web site makes use of anti-aliasing, and there’s no reason your LOB app should avoid it. It’s easier on the eyes, easier to read, and makes your text look great in any resolution. With the WPF TextBox control there is zero effort, configuration, or lines of code to achieve this effect. It’s supported out of the box and always looks great. Since WPF is included as part of version 3.5 of the .NET Framework, you can use it anywhere that you can install it. You don’t have to buy a third party component to take advantage of all of the features of the new TextBox, it does not require Windows Vista, you don’t need to install Expression Studio, and you don’t have to write a line of XAML. You can use your favorite language to leverage the classes you need when and where you need them. 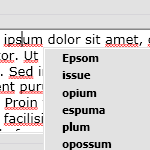 You could even use it to implement spell check within an ASP.NET web application. Don’t even think about reaching for Word Automation. Over the past month I’ve been working really hard on our new BizTalk Expert Series class for Business Activity Monitoring. I have to say that I’m really excited to start teaching it. In three days, we manage to cover almost everything one could want to know about BAM. The most interesting part of it for me is the data consumption lab. I’ve never been very fond of the BAM Portal. It’s nice, but certainly not something that I’d like to parade in front of a CEO of a big company. Don’t get me wrong, the capabilities are awesome, but the way it looks and some of its behaviors aren’t the best. In the consumption lab, we examine how to create custom consumption models for BAM data using PerformancePoint, SQL Reporting Services, and an AJAX based web site. I’d never worked with PerformancePoint before and I was surprised by how easy it was to create a dashboard based on the BAM OLAP cube.